How long it takes to build a credit score depends on where you start but here’s some FICO tips to get you started. Everyone needs good credit. Whether you’re planning on getting a loan or not, your credit score will affect more than you know in your life. From emergency loans to renting a house, getting a job and even the premiums you pay on car insurance…your credit score can either help you out or hold you back. It’s a good question. You want to give yourself the time to build a good credit score before asking for a loan, applying for a job or to try lowering your insurance premiums. It would help to know just how long boosting your credit is going to take. I want to start by saying that I hate those answers that begin with, “It depends,” but…yeah. How long it’s going to take for you to build credit will depend on whether you’re rebuilding your credit score or starting from scratch. Don’t worry, I’m not going to leave you hanging. Let’s look at both situations, how long it takes to build a fabulous FICO score no matter what your credit report looks like. How Long Does It Take to Build Credit from Nothing? More than a third of your credit score comes from your credit history, everything that’s on your credit report. Another 15% of your score comes from how long you’ve had a credit report. If you don’t have much of a credit history, either you’re a young borrower or just have never used credit much, that’s half your score that is based on nothing. Do the math with me here…50% times 0 is…ZERO. So if you have never used credit cards or any type of loan, you will probably have bad credit if you have any credit score at all. The upside to this is that it actually takes very little time to build a good credit score from nothing. As we’ll see in the next section, it’s much easier to build credit from nothing than it is from bad credit. Apply for a couple of credit cards. Use each only for as much as you have in the bank and can pay off each month. If you’re having trouble getting a card, try getting on another person's card as an authorized user. Pay your cards off each month. After six months, ask for a credit increase on your cards. Within six months after opening your first credit accounts, you’ll start seeing improvements in your FICO score. The important points here are to pay your cards off each month, to avoid paying interest and to keep a strong credit utilization ratio, and to keep current on your payments. Remember, you’re trying to build GOOD credit here so make sure you keep track of your payments. A bigger problem is raising your credit score after ruining it with missed payments. The problem here is bad credit history and that takes a lot longer to fix compared to no credit history. Bad marks will stay on your credit report from three- to ten-years depending on what they are and who put them on your report. Late payments may come off after a few years but bankruptcies will stay on your report for a decade. That makes it really hard to increase your credit score and it doesn’t take much to destroy it. Using data from FICO and some reader input, I’ve estimated the effect on credit scores from different remarks on your credit report. It takes just one missed payment to lose up to 100 points on your credit score and a bankruptcy can send it lower by more than 200 points. Just about any bad mark on your report will mean a drop into ‘sub-prime’ credit and much higher interest rates. How Long to Rebuild a Credit Score? 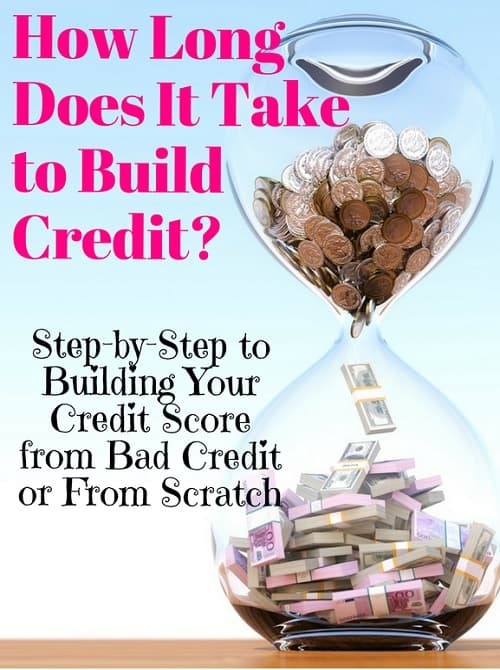 You’ll notice that people starting with higher scores see their credit drop faster. Yep, the higher they are, the harder they fall applies to credit scores also. Get as many bad marks removed from your credit report as possible. Dispute charges with the credit bureaus and negotiate with creditors. Use a debt consolidation loan to lower your interest rates and change bad credit card debt into ‘better’ non-revolving debt. Get your credit limit increased to improve your credit utilization ratio. Get current on all your bills and make sure you stay current. It will take up to two years to build your credit score after a late payment and up to five years to build your score after anything other than a bankruptcy. A bankruptcy is really going to destroy your credit score and will take up to ten years to get your score back to where it was. The good news is that your score will start increasing within a few months of getting bad marks removed, consolidating your debt and making on-time payments. It will be slow but you will notice a difference. How Long Does It Take to Build 700 Credit Score? 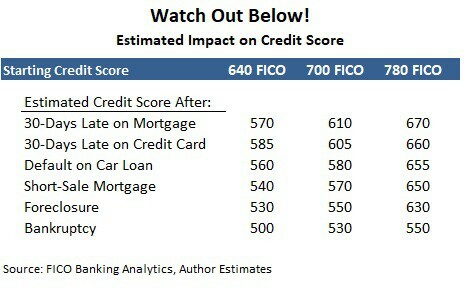 A 700 FICO score is really where you start seeing the lower interest rates and the better deals. Technically, somewhere around 680 FICO is the cutoff for ‘prime’ credit at which banks can lend but 700 is where most people consider good credit. If you’re starting from no credit at all, then getting to a 700 credit score shouldn’t take more than a few years. If you are using your credit regularly and especially if you have some other debt like student loans or a mortgage, you can build a 700 FICO score within two years. I started partially-financing rental properties when I was 22 and had a 740 credit score by the time I was 24 years old. Of course, I ruined it all in the housing bust and destroyed my credit but I was able to use some of these tips to rebuild. If you can avoid a bankruptcy, you’ll be able to rebuild to a 700 credit score much faster. Using some of the tips above, you can build to a 700 FICO within five years even after some of the worst credit mistakes like a foreclosure. How Long Does It Take to Build Credit to Buy a House? You might be able to buy a house on credit with a 600 credit score but the interest rate is probably going to make payments more than you can afford. To get decent rates on a mortgage and to even qualify at most banks, you’ll need a credit score above 680 FICO and preferably well into the 700s. That means it could take a couple of years to build credit to buy a house but this is definitely an instance where your time is rewarded. Even after you build a 680 credit score, it’s not a bad idea to wait a little longer to increase your FICO further. Waiting just a few months more to increase your credit score and buy a house can mean saving hundreds of thousands in interest. A difference of just 2% on the interest rate for a $250,000 mortgage over 30-years is HUGE! At 8% interest, your monthly payment is $1,834 and you pay over $410,000 in interest alone. A mortgage at 6% instead means a payment of just $1,499 and saving $120,790 in interest over the life of the loan. Whether you want to use debt or not, protect your credit score and start building it as early as possible. It can take from six months to ten years to build a credit score depending on where you start. 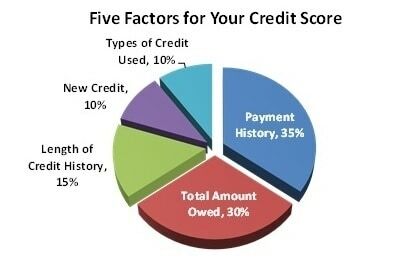 Understand what goes in your credit score, what makes for good credit and how to get started building your FICO today.